Not to be confused with George Boole. 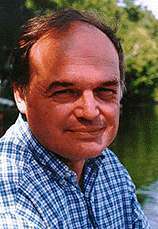 George Stephen Boolos (September 4, 1940 – May 27, 1996) was an American philosopher and a mathematical logician who taught at the Massachusetts Institute of Technology. Boolos graduated from Princeton University in 1961 with an A.B. in mathematics. Oxford University awarded him the B.Phil. in 1963. In 1966, he obtained the first Ph.D. in philosophy ever awarded by the Massachusetts Institute of Technology, under the direction of Hilary Putnam. After teaching three years at Columbia University, he returned to MIT in 1969, where he spent the rest of his career until his death from cancer. A charismatic speaker well known for his clarity and wit, he once delivered a lecture (1994b) giving an account of Gödel's second incompleteness theorem, employing only words of one syllable. At the end of his viva, Hilary Putnam asked him, "And tell us, Mr. Boolos, what does the analytical hierarchy have to do with the real world?" Without hesitating Boolos replied, "It's part of it". An expert on puzzles of all kinds, in 1993 Boolos reached the London Regional Final of The Times crossword competition. His score was one of the highest ever recorded by an American. He wrote a paper on "the hardest logic puzzle ever"—one of many puzzles created by Raymond Smullyan. Boolos coauthored with Richard Jeffrey the first three editions of the classic university text on mathematical logic, Computability and Logic. The book is now in its fifth edition, the last two editions updated by John P. Burgess. Kurt Gödel wrote the first paper on provability logic, which applies modal logic—the logic of necessity and possibility—to the theory of mathematical proof, but Gödel never developed the subject to any significant extent. Boolos was one of its earliest proponents and pioneers, and he produced the first book-length treatment of it, The Unprovability of Consistency, published in 1979. The solution of a major unsolved problem some years later led to a new treatment, The Logic of Provability, published in 1993. The modal-logical treatment of provability helped demonstrate the "intensionality" of Gödel's Second Incompleteness Theorem, meaning that the theorem's correctness depends on the precise formulation of the provability predicate. These conditions were first identified by David Hilbert and Paul Bernays in their Grundlagen der Arithmetik. The unclear status of the Second Theorem was noted for several decades by logicians such as Georg Kreisel and Leon Henkin, who asked whether the formal sentence expressing "This sentence is provable" (as opposed to the Gödel sentence, "This sentence is not provable") was provable and hence true. Martin Löb showed Henkin's conjecture to be true, as well as identifying an important "reflection" principle also neatly codified using the modal logical approach. Some of the key provability results involving the representation of provability predicates had been obtained earlier using very different methods by Solomon Feferman. Boolos argued that if one reads the second-order variables in monadic second-order logic plurally, then second-order logic can be interpreted as having no ontological commitment to entities other than those over which the first-order variables range. The result is plural quantification. David Lewis employed plural quantification in his Parts of Classes to derive a system in which Zermelo-Fraenkel set theory and the Peano axioms were all theorems. While Boolos is usually credited with plural quantification, Peter Simons (1982) has argued that the essential idea can be found in the work of Stanislaw Leśniewski. Shortly before his death, Boolos chose 30 of his papers to be published in a book. The result is perhaps his most highly regarded work, his posthumous Logic, Logic, and Logic. This book reprints much of Boolos's work on the rehabilitation of Frege, as well as a number of his papers on set theory, second-order logic and nonfirstorderizability, plural quantification, proof theory, and three short insightful papers on Gödel's Incompleteness Theorem. There are also papers on Dedekind, Cantor, and Russell. 2007 (1974) (with Richard Jeffrey and John P. Burgess). Computability and Logic, 4th ed. Cambridge University Press. LLL = reprinted in Logic, Logic, and Logic. FPM = reprinted in Demopoulos, W., ed., 1995. Frege's Philosophy of Mathematics. Harvard Univ. Press. 1969, "Effectiveness and natural languages" in Sidney Hook, ed., Language and Philosophy. New York University Press. 1977, "On deciding the provability of certain fixed point statements," Journal of Symbolic Logic 42: 191-193. 1979, "Reflection principles and iterated consistency assertions," Journal of Symbolic Logic 44: 33-35. 1980a, "On systems of modal logic with provability interpretations," Theoria 46: 7-18. 1980b, "Provability in arithmetic and a schema of Grzegorczyk," Fundamenta Mathematicae 106: 41-45. 1985c (with Giovanni Sambin), "An incomplete system of modal logic," Journal of Philosophical Logic 14: 351-358. 1987c (with Vann McGee), "The degree of the set of sentences of predicate provability logic that are true under every interpretation," Journal of Symbolic Logic 52: 165-171. 1988a, Review of Craig Smorynski, Self-Reference and Modal Logic, Journal of Symbolic Logic 53: 306-309. 1990b, Review of V. A. Uspensky, Gödel's Incompleteness Theorem, Journal of Symbolic Logic 55: 889-891. 1990c, "The standard of equality of numbers" in Boolos, G., ed., Meaning and Method: Essays in Honor of Hilary Putnam. Cambridge Univ. Press: 261-278. LLL; FPM: 234-254. 1994a, "The advantages of honest toil over theft," in A. George, ed., Mathematics and Mind. Oxford University Press: 27-44. LLL. 1995a, "Introductory note to *1951" in Solomon Feferman et al., eds., Kurt Gödel, Collected Works, vol. 3. Oxford University Press: 290-304. LLL. *1951 is Gödel's 1951 Gibbs lecture, "Some basic theorems on the foundations of mathematics and their implications." 1996, "The Hardest Logic Puzzle Ever," Harvard Review of Philosophy 6: 62-65. LLL. Italian translation by Massimo Piattelli-Palmarini, "L'indovinello piu difficile del mondo," La Repubblica (16 April 1992): 36-37. 1997a, "Is Hume's principle analytic?" In Richard G. Heck, Jr., ed., Language, Thought, and Logic: Essays in Honour of Michael Dummett. Oxford Univ. Press: 245-61. LLL. 2000, "Must we believe in set theory?" in Gila Sher and Richard Tieszen, eds., Between Logic and Intuition: Essays in Honour of Charles Parsons. Cambridge University Press. LLL. General set theory, Boolos's axiomatic set theory just adequate for Peano and Robinson arithmetic. ↑ Van Gelder, Lawrence (30 May 1996). "George Boolos, 55, Philosopher". NY Times. Peter Simons (1982) "On understanding Lesniewski," History and Philosophy of Logic. Solomon Feferman (1960) "Arithmetization of metamathematics in a general setting," Fundamentae Mathematica vol. 49, pp. 35–92.